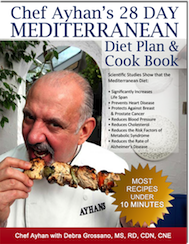 Debra compared Ayhan’s Mediterranean Menu Plans® vs. the Sonoma Diet™. Promotes portion and calorie control. Promotes portion and calorie control. Believes food should be enjoyed and taste good. Believes food should be enjoyed and taste good. No phases. Consistent foods and consistent meal plan. Has 3 distinct phases. No restrictions on fruits and alcohol at any point. Expect consistent weight loss that will stay off. Phase 1 is very restrictive, no fruits or alcohol, and results in rapid weight loss. Rapid weight loss is unhealthy and tends to result in rapid weight gain when the diet is not followed. A realistic meal plan that is easy to follow at all times. Phase 1 is difficult to follow and unrealistic. Does not result in deprivation at any point of the meal plan. People will likely want to remain in phase 1 of the diet because of the quick weight loss. However phase 1 is not well balanced and is a set up for deprivation and yo-yo weight loss. Involves recipes that are easy and quick to make. Gives alternate cooking methods and ingredients that shorten time. Ingredients are affordable. A “no cook” meal plan is available. Entire diet is based on complicated and time consuming recipes that require expensive ingredients. A realistic meal plan that does not have unrealistic expectations. Promotes healthy foods, but understands that people cannot eat perfectly all of the time. All foods can fit into the meal plan. The diet asks people to get rid of all food in their house containing refined flours, non whole grains, hydrogenated and saturated fats, sugars and any oil other than olive, nut or canola. Foods can be purchased online or in any supermarket. Recipes call for ingredients that may only be available in specialty stores. Website has an entire section for exercise, including a fitness expert and access to fitness videos and information. Briefly touches on exercise. The Sonoma Diet™ is a registered trademark. All product and service marks are the trademarks of their respective owners.